Z Yang is a new contemporary American Girl who loves making movies. 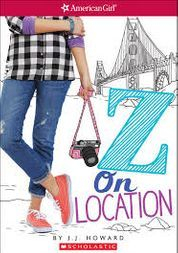 In her second novel, Z is thrilled to be going on the road to help her mom film a documentary. She might even get to interview her vlogging idol, Winter Costello, at VidCon! Eager to share her summer adventure with her friends and vlog fans, Z keeps her phone and camera at the ready. But she finds that working on a real film set takes more focus than she expected. When her love of connecting online threatens to ruin her chances of connecting in real life with her idol and fans, Z faces the ultimate test: Can she survive off-line and learn to #liveinthemoment?